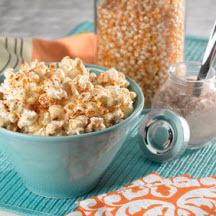 Sugar, plus sweet and hot spices—make this popcorn seasoning mix tasty and nice. Stir spices together in a small bowl. Place popcorn in a serving bowl and spray lightly with cooking spray. Sprinkle about 2 teaspoons (or to taste) of the mix over popcorn and toss to distribute evenly. Store leftover seasoning mix in an airtight container for future use. Makes about 4 tablespoons seasoning mix.